I was also very fortunate to have been able to practice for many years with Guy McDannold, a legendary litigator for local government who took a pile of dirt all the way to the Supreme Court of Canada and won a victory for local government authority—establishing a relatively short-lived standard of review of ‘patent unreasonableness’ for local government decisions, but based on the principle that local government decisions within their jurisdiction should be treated by the courts with deference. The world has changed considerably since my call to the bar in 1987. British Columbia had just held Expo ’86 and invited the world to Vancouver, little thinking that the world would actually accept the invitation and turn Vancouver into a cosmopolitan international city. Hair was big. Cell phones were enormous. Fax machines were the latest in office technology. Nan & I bought our first house in Victoria for $86,000 in 1988 and thought we were being gouged! The idea of paying three times one’s annual salary for a home seemed ludicrous. Where will it end? The municipal law landscape has also changed significantly since then. We had one principal statute to deal with—the Municipal Act. A handful of regulations. Some letters patent. There were scant statutory provisions for conflict of interest. No rules about in camera meetings. No Freedom of Information and Protection of Privacy Act. No computers on lawyers’ desks. No email. Since then, 3 decades of legislative reform have resulted in 2 jam-packed primary statutes, and a myriad of complex regulatory schemes. Municipalities have become ‘natural persons’ and regional districts have evolved into sophisticated regional governments tackling some of the big issues associated with regional growth, transportation and climate change. In B.C., unlike other jurisdictions in Canada, we have resisted the urge to amalgamate municipalities into supersized cities, and in many ways have preserved a sense of community and empowerment for the people, evidenced just recently in the last set of local elections. If regional governments can manage the regional stuff, perhaps there is a place for local councils deciding what matters in local neighbourhoods, small towns and urban villages. 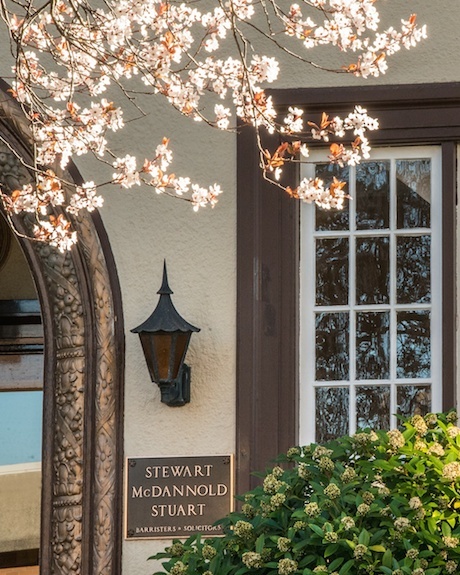 Over the years as partners and lawyers came and left, Wilson, Staples, McDannold & Marley became Staples McDannold Stewart and then Stewart McDannold Stuart. I have had the great honour of working with some terrific lawyers. The indomitable Kathryn Stuart joined the firm as a summer student, and then articled with the firm. Robert Macquisten joined as a young litigator and in the ’90s seemed to single-handedly resolve the leaky condo crisis for a number of our clients caught up in that controversy. We lured the unflappable Peter Johnson over to the Island in 2001. Ryan Bortolin, the newest SMS partner (as of January 2019!) has brought a keen mind and steady head to the office and has been persuaded to abandon litigation for solicitors’ work. In 2017 we were joined by litigator Jeff Locke as associate counsel, who brought a powerhouse of advocacy skills. A number of our capable associate lawyers have gone on to work in-house for municipal and regional governments, including Michael Hargraves (Saanich), Kristen Morley (CRD), Andrea Brace and Anita Bleick who both worked with Metro Vancouver. Of the handful of articled students that had to endure me as their principal, Jessie Givner has found her niche with the Province and most recently, Sean Smith has gone to work for the City of Merritt. Marie Watmough remained with SMS where we can make use of her many skills both within the courtroom and right at her desk (which she always keeps well stocked with candy). But what is most exciting has always been to see the up & coming new lawyers, and with associates Marie, Josh, Kerri, Heidi and Andie, SMS has a roster of top notch young talent. I am confident they are going to carve out great careers in local government law. Our local government and other public authority clients are in good hands. I also want to recognize the contribution of our hard-working assistants: Annette, Kelly, Ruth, Jaclyn, Rekha, Cia, and Kat. And they have taken the place of many hardworking and talented predecessors too numerous to mention, some of whom have gone on to have their own brilliant careers in local government management (Hey, Karla). And the place would come apart at the seams without the steady hand, caustic humour and indefatigable efforts of Susan Smart who serves SMS as Office Administrator, Countess of Accounting, Recycling Diva and Storage Maven. It has been a real privilege and honour to have worked with so many outstanding and dedicated people in the local government field over the years. I will miss working with you a great deal—your knowledge, intelligence, insight, and integrity are a credit to your profession. As for me I am looking forward to a real change of pace. Thirty-one years is a long time, and although I have enjoyed it immensely, I am looking forward to some new stuff. Travel to exotic parts of the globe is high on my list, starting with Christmas in Tokyo to visit our son, the japanophile. And I am keen to pursue painting, with my first goal to paint my way around Vancouver Island. So, if you see someone pretending to be Van Gogh (but with both ears) perched behind an easel on the side of the road in your community, it might just be the former municipal solicitor. Stop and say hello, without risk of an invoice. I will, however, remain with SMS in an associate counsel role providing continuity on some matters for our clients and to assist with projects. So, to paraphrase Monty Python, “I’m not gone yet”!